Today, we are evaluating three mid-range video cards on PCI-Express based on the ATI Radeon X700 Pro and NVIDIA GeForce 6600GT graphics processors. The Radeon X700 series has, to some extent, been a bit of a blip for ATI after the problems that we encountered during our X700 XT preview, which then lead to the X700 XT being later removed from ATI’s product line up. 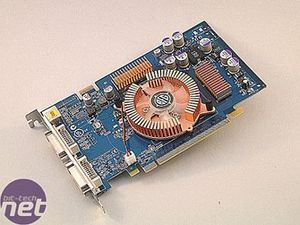 To the contrary, the GeForce 6600GT has been a great success for NVIDIA, and we have been very impressed by the GeForce 6600 series in general, with it delivering class-leading performance on both AGP and PCI-Express. Unfortunately for ATI, they yet to roll out their PCI-Express to AGP bridge chip in numbers, so their mainstream AGP parts are the last generation high-end video cards: The Radeon 9800 Pro and Radeon 9800 XT, which simply do not compete with the GeForce 6600GT when value for money is considered. 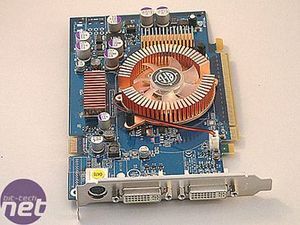 However, on the PCI Express front, where ATI have been creating native parts, things are more competetive. BFG Technologies have been a long-time favourite brand for NVIDIA-based video cards in North America, thanks to their absolutely fantastic customer service. It is no mean feat for a company to offer and more importantly deliver a 24 hour, 7 days a week customer support line – this is one thing that brings BFG Technologies head and shoulders above the chasing pack. They also deliver a true lifetime warranty that includes support after the card has ceased production – something that many manufacturers do not offer when they claim a lifetime warranty. With their recent introduction in to the UK market via PCWorld, you can now experience customer support the BFG way, over this side of the Atlantic Ocean too. Unfortunately for us Brits, there is no free telephone service – nonetheless, if you are can’t afford to ring them, you can always email them. The card has 128MB of GDDR3 memory that is covered with copper RAM sinks to aid when overclocking the video card beyond specification. Here, it is also worth noting that all of BFG’s “OC” line-up is factory overclocked – this one runs at 525/1050MHz, which is 25MHz above stock on the core, and 50MHz (effective) above the reference memory clocks. The heatsink on the core is a very good one as it is quiet, efficient and does not wobble like some other retail GeForce 6600GT coolers we have seen. When the video card is operating, it emits a bright blue glow from three blue ultra-bright LEDs located underneath the clear fan. The cooler’s efficiency is down to the fact that there is a large surface area of copper, while the sturdiness comes from BFG implementing a shim on the NV43 GPU. The shim is a godsend, as there have been issues with many GeForce 6600GT coolers, to the extent that they were great coolers, until you touched them. The heatsinks on the memory should prove to help matters with stability of the video card too – there have been many threads cropping up in our graphics cards forum regarding artifacting and problems that point to bad memory or poor contact between the GPU and heatsink with retail GeForce 6600GT’s – we expect these additions to reduce these reported issues to a minimum. 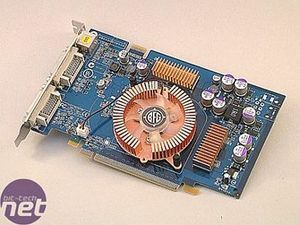 The PCB layout follows NVIDIA’s reference design fairly closely, with the exception of the dual DVI connectors that BFG have chosen to implement. 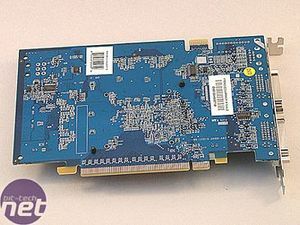 There’s the standardised SLI connector on the top of the card and it is important to note that the card does not require additional power, as the PCI-Express interconnect provides more than enough power to the video card. The bundle is fairly basic – there are no full game titles included, this may or may not please the consumer, but in exchange for that you do get 24/7 technical support, unlike many competing video card manufacturers. 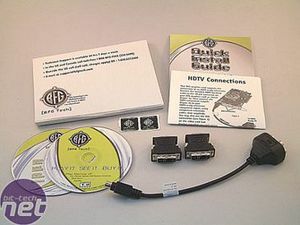 There are two DVI to VGA converters and a HDTV multimedia adapter that lets you connect S-Video, Composite, and Component video out. As mentioned, there are no full game titles included, but there are demos of Painkiller, Silent Storm, and Splinter Cell: Pandora Tomorrow.